Property stylist Julia Treuel has applied her love of cool tones and a classic aesthetic to create a little slice of Hamptons magic in metro Melbourne. Julia and Sasha, who are also partners in the business, Sasha taking care of the business side while Julia focusses on creative, said their original intention to sell the home once it had been renovated was overturned when they fell in love with it all over again for what they describe as the perfect marriage of old and new. Fast-forward two years and the duo decided it was time to sell the house, taking it to market late last year amidst a stellar campaign. “I filmed a home tour with our agent that showed the property in a beautiful light. To say we were thrilled with the end result is an understatement. As for the buyer, my lips are sealed. Let’s just say I won’t be surprised if the house pops up on our screens later this year!” quips Julia. The close proximity to the beach was one of Julia and Sasha’s favourite aspects and they wanted to reflect that in their home. “There’s a certain softness in the décor and I’ve utilised natural materials throughout. Together, these elements create an airy, almost whimsical vibe. The cool tones elicit a feeling of tranquillity and provide the perfect anchor for our seaside abode,” says Julia. From a style perspective, generally speaking, Julia says she is a fan of the crisp, clean aesthetic including the simplicity of Scandinavian design and the softness of coastal living. “I lived in New York for some time and adore American architecture. They have a knack for stunning weatherboard and gorgeous front doors. “I’m happiest in a home filled with light, white, and gentle pops of colour. In this home we maintained the original 12 foot ceilings, installing highlight windows for added impact. The oversized French doors are stunning and bring a classic element to the modern, open-plan. We chose to keep the original bay window as a nod to the past. It frames the wall garden beautifully and creates a real focal point,” she says. 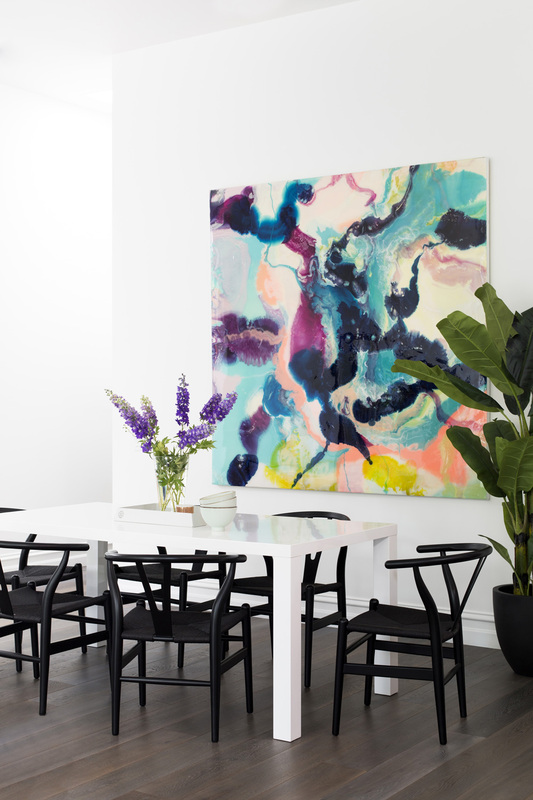 In coming up with the beautiful and unexpected colour scheme of this home, Julia says it came down to her love of cool tones and desire for the exterior to reflect the bayside location. Want to see this home in print? You’ll find the full home tour in our Aloha edition, available through our online shop. Click here to buy.